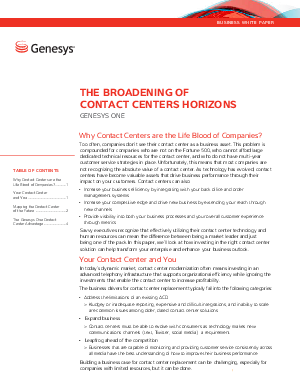 Contact Centers are the Life Blood of Companies. Too often, companies don’t see it as the business asset it is. This is compounded if you are not a Fortune 500 company who can afford large dedicated technical resources for the contact center, and who do not have a multi-year customer service strategy in place. As technology has evolved, contact centers have become valuable assets that drive business performance through their impact on your customers. Savvy executives recognize that effectively utilizing their contact center technology and human resources can mean the difference between being a market leader and just being one of the pack. In this paper, The Broadening of Contact Center Horizons, we’ll look at how investing in the right contact center solution can help transform your enterprise and enhance your business outlook.